With opportunistic crime now, part and parcel of everyday living both in Co. Tipperary and indeed further afield; a long overdue, new and much needed house sitting service has been conceived here in the Premier County. Most people are aware that certain criminal elements are now using information gleaned from social media blogs, newspaper and local magazine reports, which indicate that private homes, farms and private businesses may be left temporarily unattended, due to that wedding celebration; the well earned weekends away; the annual holiday, or sadly the required attendance at the funeral of a friend or close relative. Imagine attending such an event in the clear knowledge that a competent, trustworthy individual is inside your property for the few hours you are forced to leave your home unattended. The good news, which we only learned today, is that a new service has come on stream over the past number of months here in the county; its name “House Sitting Service”. Reports which I have gleaned from numerous previous users of this now necessary urban and rural service, all declare, without hesitation, that they have found this Garda approved service to be totally professional, while operating with discretion and offering total confidentially. The House Sitting Service provider will arrive well before their host need to vacate the property, in order to receive any special instructions, and will remain in your home until the host themselves or some other members of the family return to relieve the situation. From the reports we have received here on Thurles.Info, to date, already this amenity is proving an invaluable service within the Tipperary area. Readers do take this opportunity to make a permanent note of this contact phone number, (shown hereunder), for inclusion in your own personal contacts held on your mobile phone. 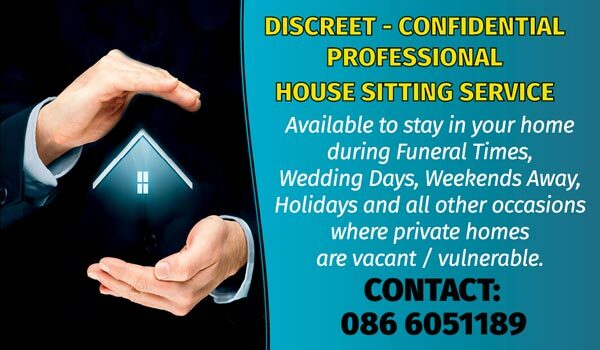 To communicate with this “House Sitting Service” simply phone Mobile No: (086) 6051189 and arrange to meet the service provider, prior to your special event. Stop Food Waste – Make the most of your food. Irish householders on average throw out €700 worth of food every year. This week the EPA is running an awareness campaign called Food: Make the Most of It, highlighting food waste issues and encouraging everyone to make the most of their food. Though the individual amounts may seem small, when added up the total volume of food waste produced in Ireland every year adds up to over 1 million tonnes. Some of the most common types of food we throw away include meat and fish, dairy products, bread, fruit and vegetables. Stop Food Waste has developed an A – Z of Foods , a handy resource that provides ingredient specific tips to make the most of these common food items that often go to waste. The A-Z of Foods located HERE, is a new on-line resource packed full of tricks and tips on buying, storing, freezing, and using up your food. Have a browse and learn how to make the most of your food and reduce waste. Led by existing good practice and strong political commitment, people are being encouraged to take action and achieve an Ireland where food is consumed, not wasted. The National Ploughing Championships for 2017 are being held in Screggan, Tullamore, Co. Offaly from and including today until September 21st next. Travel the Blue Route: If you are travelling from the Southern Ireland, Gardaí are advising all motorists to exit the M8 at Junction 6, (Horse and Jockey, Thurles), and onto Templemore and Roscrea on the N62. In Birr, Co Offally, traffic will join the N52 travelling northbound via the villages of Kilcormac and Blueball and onto the event site at Screggan, in Tullamore. A video for people travelling from the South can be found HERE. Patrons arriving at their Ploughing Championships destination using this route will park in the designated BLUE car parks on the left and right hand side, beside the event grounds. Where necessary motorists will be directed by Gardaí and stewards towards the event. A national traffic plan detailing all routes and parking areas can be found HERE. Of course if you are looking for a break from driving, Thurles is the ideal location to halt awhile, for a snack or a cup of tea or coffee. For those of our readers, parents, who have young children; latter who are beginning for the first time to access ‘Personal Computers’ (PC’s) or ‘Laptops’, you may wish to take note regarding the following. In an effort to halt the viewing, by young minds, of shall we say certain questionable content online, there is an alternative; its name is KidRex.org; a Google powered, kid friendly, search engine and an alternative to the more widely used Mozilla Firefox. This most certainly should become an alternative, particularly for students in schools which rightly encourage young people on how to correctly make use of the internet. Here they can learn how to locate online information, without the unremitting worry by teachers and parents, regarding what young minds may accidentally stumble upon. KidRex combines Google’s Safe Search with their own database of questionable sites, locking everything into child appropriate searches, while maintaining its own database of inappropriate websites. You are advised to check regularly to insure that KidRex remains up and running, thus ensuring that your children have the best web surfing experience possible. 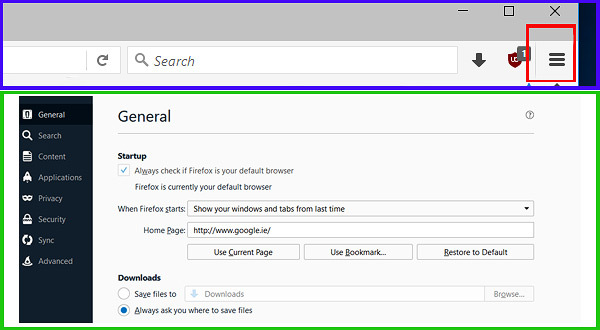 (1) Open your ‘Menu’ (See Image above – Find three parallel flat lines positioned top right of your Google search panel, shown here above in a red box), by clicking left with your Mouse. (2) Find an icon marked ‘Options’ (Dead Centre) and activate same, also by left clicking with mouse. (3) The page which now opens will be headlined ‘General’, (Again see image above). Next copy and paste the following link http://www.kidrex.org/ into the second text panel, clearly marked Home Page, thus removing link http://www.google.ie/. Do nothing else; simply close the page and your default search engine should now remain KidRex.org on that particular appliance. To change it back, simply reverse this simple procedure at any time. 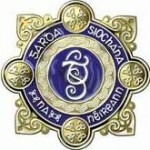 Tipperary – Had Anything ‘Nicked’ Recently? Following a series of surveillance led operations by Gardaí in Tipperary and adjoining Garda Divisions, a considerable quantity of stolen equipment has, thankfully, been recovered. This recovered property includes item such as industrial generators, gardening equipment, chainsaws, power tools, agricultural equipment etc, all believed stolen during burglaries in Ireland and in the UK. In an effort to reunite this recovered property a ‘Property Recovery Day‘, will take place between 3.00pm and 7.00pm on Tuesday next, June 27th, and on Wednesday next, June 28th, 2017 respectively, in Comerford’s Yard, Tyone, Nenagh, Co Tipperary, (Formerly the old Castle Brand Factory). Normally property recovered by An Garda Síochána is returned to an identified owner, however this displayed property has as yet not been fully identified or claimed and presently remains in Garda custody. The victims of crime, attending to view this property, can also readily take advantage of advice from a Crime Prevention Officer and Victims of Crime Services, who will be present on both afternoons. For further information why not contact the Gardaí at Thurles, Tel: (0504) 25100, or if more appropriate to your area, Kilkenny Garda Station, Tel: (056) 7775000.